Lenin wrote LWC in April 1920, and it was published in Russian, German, English and French a few months later. At the second congress of the Communist International held in July, Lenin’s pamphlet was distributed to every delegate. The date of publication was no accident. Only in Russia had revolutionaries created a party that had taken power and created a new socialist order. After 1917, workers everywhere began looking to the Bolsheviks for inspiration and guidance. Revolutions and unrest swept across Europe, from Germany to Italy to Spain to Scotland. While none of these revolutions succeeded in replicating the Russian example, it was not unreasonable for Lenin to assume that a generalized revolutionary crisis still existed in Europe and that communists needed to be ready to take advantage of it. The newly formed communist parties fired up by the Bolshevik example faced a number of problems. While they had the most militant and revolutionary workers in their ranks, these were still only a minority of the labor movement. By contrast, reformist socialist parties such as the German Social Democratic Party had millions of members and clearly held hegemony over the organized working class. But the reformist parties had betrayed their internationalist principles by supporting the bourgeoisie in World War I and remained obstacles to the overthrow of capitalism. For the communist parties, an immediate task was to win over the majority of sincere and honest workers who still followed the reformist parties. Unfortunately, the communist parties, which were a mix of revolutionary and ultraleftist wings, were not up to the challenge of winning the working class or flexible enough to think strategically or tactically. These parties were characterized by a left communist trend represented by Amadeo Bordiga, Herman Gorter, Anton Pannekoek and Sylvia Pankhurst; this trend rejected any compromises or united front work with reformists, refused to participate in reactionary-led trade unions or in any parliamentary elections. While Lenin believed that left communism was a natural reaction of young, inexperienced and newly radicalized workers to the betrayals of the opportunistic socialists, he believed that it needed to be overcome with patient explanation. Otherwise, the left communist slogan of “no compromise, no maneuvers” was bound to lead to isolation, ossification and the revolution’s defeat. We do not and cannot know which spark—of the innumerable sparks that are flying around in all countries as a result of the economic and political world crisis—will kindle the conflagration, in the sense of specially rousing the masses, and we must, therefore, with the aid of our new, communist principles, set to work to “stir up” all and sundry, even the oldest, mustiest and seemingly hopeless spheres, for otherwise we shall not be able to cope with our tasks, we shall not be comprehensively prepared, we shall not master all arms and we shall not prepare ourselves to achieve either the victory over the bourgeoisie (which arranged all sides of social life—and has now disarranged them—in its bourgeois way) or the impending communist reorganization of every sphere of life after that victory. On the other hand, having arisen on this granite theoretical foundation, Bolshevism passed through fifteen years (1903-17) of practical history which in wealth of experience has no equal anywhere else in the world. For no other country during these fifteen years had anything even approximating to this revolutionary experience, this rapid and varied succession of different forms of the movement—legal and illegal, peaceful and stormy, underground and open, circles and mass movements, parliamentary and terrorist. In no other country was there concentrated during so short a time such a wealth of forms, shades, and methods of struggle of all classes of modern society, and moreover, a struggle which, owing to the backwardness of the country and the severity of the tsarist yoke, matured with exceptional rapidity and assimilated most eagerly and successfully the appropriate “last word” of American and European political experience. There are compromises and compromises. One must be able to analyze the situation and the concrete conditions of each compromise, or of each variety of compromise. One must learn to distinguish between a man who gave the bandits money and firearms in order to lessen the damage they can do and facilitate their capture and execution, and a man who gives bandits money and firearms in order to share in the loot. Considering that the task of revolution was so protracted and complicated, Lenin believed that communists could not rule out compromises such as retreating, taking advantage of conflicts among the enemy and working with even unstable allies without tying their hands in advance. Lenin’s underlying argument in LWC called on communists to work wherever the masses are to be found. He believed that revolutionaries must at the same time relate to both the revolutionary minorities and the reformist majorities in the working-class movements. This work required running communist candidates in elections. When it came to parliamentary institutions, Lenin understood that most workers still had illusions in them. Therefore, it was necessary for communists to run for elections with their own program, independently of the bourgeois parties. Unlike the reformists, communists did not believe in a parliamentary path to socialism. Rather, it was the task of communists in bourgeois parliaments to, as Lenin says in LWC, “wage a long and persistent struggle, undaunted by any difficulties, to expose, dissipate and overcome these prejudices.” In other words, communists in parliament needed to tear off the mask of bourgeois democracy and expose its true nature to the working class. So long as the working class and its vanguard are not strong enough to destroy parliament, it can be used as a platform for communists to spread their message. Ultimately the center of working-class activity remains in the factories and the streets, not at the ballot box. It is precisely this absurd “theory” that Communists must not work in reactionary trade unions that brings out with the greatest clarity how frivolous is the attitude of the “Left” Communists towards the question of influencing “the masses,” and to what abuses they go in their vociferations about “the masses.” If you want to help “the masses” and to win the sympathy and support of “the masses,” you must not fear difficulties, you must not fear the pinpricks, chicanery, insults and persecution on the part of the “leaders” (who, being opportunists and social-chauvinists, are in most cases directly or indirectly connected with the bourgeoisie and the police), but must imperatively work wherever the masses are to be found. 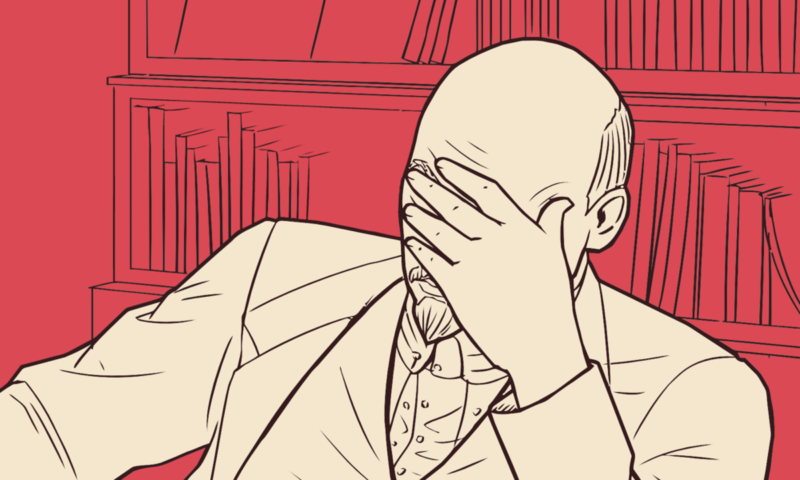 Those who misuse Lenin for their opportunism believe that the main danger facing the left is ultraleftism. Now, it is certainly true that there are forms of militancy that are adventurist and voluntarist and that fail to link up with the masses or that pursue militancy for its own sake. And there are forms of radical posturing that are real drawbacks and problems. There are certainly ultraleft forms of impatience, youthful naivete and sectarianism. All this is undoubtedly true, but this is not the main danger confronting us on the American left now. In fact, it barely registers. The main problem right now is a wretched form of parliamentary cretinism and opportunistic tailing of the liberal bourgeoisie, one that threatens to suffocate revolutionary politics in their entirety. In other words, “ultraleftist” is little more than a curse word that opportunists use to condemn revolutionaries and revolutionary politics. And by their criteria, the worst “ultraleftist” would be Lenin himself. Contrary to his distorters, Lenin’s LWC remains an invaluable exposition of strategy and tactics for communists to win over the masses to a genuine revolutionary movement for socialism, not to support enemies of the working class in the Democratic Party.